I Do Not Want this but I love it? I love to watch almost any kind of procedural show from the sublime (Elementary) to the ridiculous (Hawaii Five-O) but I usually loathe reading police-focused detective novels. I like my mysteries to be Cozy. I need a butler serving tea to the vicar in the library while someone is murdered by undetectable exotic poison in the Conservatory. I don’t want to read about violent grisly death or forensic details or police procedure in the modern world. I also don’t particularly enjoy paranormal books where supernatural forces actually exist in our world (there are obvious exceptions, ie Harry Potter). Give me a straight-up Fantasy world with dragons and sorcerers and I’m in, but I tend to not like books about vampires or fairies in our world. It’s just not my thing. All of which to say: this is a series about a police constable in modern London who is part of a secret branch of the Metropolitan police that investigates magical crimes. There are vampires and river goddesses and fairies. And I love it. The first person narrator is a young police constable called Peter Grant, who meets a ghost at a murder scene and ends up discovering that magic is real and he can detect it. He is re- assigned as the apprentice of wizard/ Detective Inspector Nightingale to investigate the suspiciously weird series of murders. Peter has a background in science so he experiments and investigates the magic he comes across from a scientific perspective. No one seems to know where the magic comes from, so Peter is constantly trying to work it out as he is learning how to use it. This series was highly recommended on a Discworld Facebook group I’m in, and the author dedicated a later book in the series to Sir Terry. He’s clearly a fan and it shows. I think that is what I respond to– the London of this book is basically Ankh-Morpork (I know that Ankh-Morpork is actually London, but frankly I’m more familiar with A-M than London, so…) Peter is a copper in the style of Sam Vimes. The way he describes police procedure makes the Met sound like the City Watch. He describes historical sites and neighbourhoods like Pratchett describes Ankh-Morpork. I don’t know how, because this is a very modern series set in real world London, but it feels like a Discworld novel. Also of note: Peter is of mixed race. The author is not, but I think he does a really good job of describing a genuinely diverse city and its citizens as all just Londoners. When describing characters, he mentions their race whether they are white, brown or black. There is no white-as-default. There are many different races of both regular people and magical beings. Neighbourhoods are described as predominantly inhabited by certain cultures when relevant, but in a “this is all part of London” way. Peter being a person of colour and a magical practitioner are both significant parts of his life as a police officer. This series fits directly into my category of Do Not Want but I’m already halfway through the third book as I write this review of the first one. Share the post "I Do Not Want this but I love it?" I spend most of my waking hours reading and re-reading picture books to my 2 demanding Squishies, about which I have strong opinions (both the books and the Squishies). I hope to actually read some grown up books this year, but I probably won't feel as passionately about them as I do the children's books, to be fair. I keep meaning to read this. Maybe I’ll see if it’s available at my library. Great review! I haven’t read any Pratchett (other than Good Omens), but I’m always toying with the idea in the back of my mind. 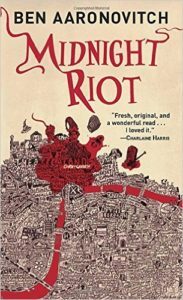 I too am hesitant about magic in books, but based on your review, since I adore the Rivers of London series, it sounds like I might have to finally bite the bullet and check out Discworld. Second the recommendation of the the Watch books. They are my favorite. Followed closely by the Death ones. DEATH SPEAKS IN ALL CAPITAL LETTERS and is constantly trying to not be Death. Like just constant mid-life (death?) crises. Ok. So that’s part of what stopped me from reading them before – there are SO many! It looks like the Watch books start with Guards!Guards!, is that the best place to begin? Yes. Starting with Guards! Guards! is an excellent intro to Ankh-Morpork and the Watch and the whole style of the thing. Pratchett’s style developes and sharpens over time, but he’s pretty much on form by the 8th book in the series. I really enjoyed Rivers of London, and when I’m finished with Harry Potter, I’ll be going back to the series. We appear to have very similar reading wants/needs and I’ve been wavering about adding this to my to read. Looks like I’m sold. Also, the Witches books by Pratchett are perhaps my soul in written form. I love them, even when I don’t rate them 5 stars. Granny Weatherwax is on my list of Top 5 superheroes. She is exactly the cranky old lady I aspire to be. The Witches are my favourite. I love her so much. She’s the hero we need, even if we don’t deserve her. Hashbrown Witch Life Goals. I still haven’t been able to force myself to read The Shepherd’s Crown, for Reasons. I may be as old as Granny before I am emotionally strong enough. Or never. Never is also likely. About 30% of your review (and comments) went completely over my head. I have no idea was Ankh-Pomorph is, but I am guessing you are referencering another book series… ? Sorry didn’t respond sooner, I’m having notification issues with my email. I’m referencing the Discworld Series by Terry Pratchett, and like a jerk I didn’t realize how obscure I was being until I re-read my review and comments.